The Indian fuel retailers are on the verge of collapse unless an immediate rectification is carried out to stay afloat. Both the government and apex body of fuel retailers are working towards this goal. For a period, volatility of the crude oil price is giving a hard time to fuel retailers. On June 22, 2009 the price of crude oil touched $71.20 a barrel. The situation proved to be discomfiture for the ministry officials who preferred to stay mum only to add more rumours on the possible hike of fuel price, which can be anything between Rs 2 a litre for petrol and Re1 for diesel. The present development is causing PSU oil firms a loss of Rs 2.96 a litre on diesel, Rs 6.08 a litre on petrol, Rs 12.65 a litre on kerosene and Rs 62.49 on every LPG cylinder. The amount of loss can be Rs 38,700 crore in this fiscal for these government-run oil firms. The situation is posing a serious concern for the government which is already reeling under the mounting bills of subsidy. This instability in the oil market is aggravating the woes of private players like Essar, Shell and Reliance. The soaring price of crude oil is further widening the gap between public and private oil firms. In contrast to the government-run fuel retailers, private players never receive subsidies. As a result much hyped fuel retail venture by Reliance and Essar was dented by the closure of the pump stations for the price discrepancies between public and private players. The dipping crude oil price at the end of the last year, as low as $32.40 a barrel, encouraged these private players to re-open their petrol stations. 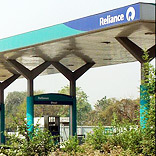 Currently, Reliance Industries run 50 outlets to sell diesel and Essar operates 1,233 outlets to sell both petrol and diesel. The price of petrol sold by these private retailers generally stays Rs 1-1.50 above than what is being sold by the public retailers. The surge in crude oil price can push this differential further to Rs 2-2.50 a litre for petrol and Rs 1-2 a litre for diesel. Recently, Essar declared that it had raised diesel prices by Rs 1-2 a litre and petrol prices by Rs 1-2.5 a litre, depending on the location of the petrol pump. This chasm between private and public players will ultimately hamper the healthy growth of petroleum retail market where growing demand will be far ahead of the supply which cannot be met by the sole presence of state-run fuel retailers. In an order to bring some uniformity in fuel retail market where private players can match the price offered by public players, and at the same time ensuring fuel retailing doesn’t turn into a loss incurring business, Petroleum Federation of India (Petrofed), the apex body of public and private oil firms, has proposed Petroleum and Natural Gas Ministry to decontrol the petrol diesel prices. Petrofed asked the government to re-implement the solution taken on March 28, 2002 that decontrols petrol and diesel prices from the administrative control. It was only when UPA came into power in 2004 the regulation was brought under administrative controls. The buzz is around that awaiting budget will have some sops for the fuel retailers in term of price decontrol. Under this decontrol programme the fuel retailers will have the right to fix prices within a certain band. The government will only interfere when crude oil price moves up above a level of $75 a barrel. However, once prices are deregulated in the current market, prices of petrol can shoot up to Rs 5.10 a litre and diesel by Rs 2.60 a litre. But under the given condition, retail prices cannot be increased more than 15-20 per cent at one shot and the prices will be reviewed every fortnight according to the global prices. Once the programme is implemented, the benefits can be realised by the upstream for the lesser subsidy burden and private players will have a more competitive market to stay active in the wake of uniform pricing strategy.